Good Morning. This is Alex Marienthal with spring weather and snowpack information on Friday, April 12th at 7:30 a.m. The Gallatin National Forest Avalanche Center has stopped issuing daily avalanche forecasts for the season. We will issue weather and snowpack updates on Monday and Friday mornings through April. This bulletin does not apply to operating ski areas. Recent snow makes it possible to trigger dry or wet avalanches this weekend. Before riding on or underneath steep slopes carefully assess the stability of the top couple feet of snow. 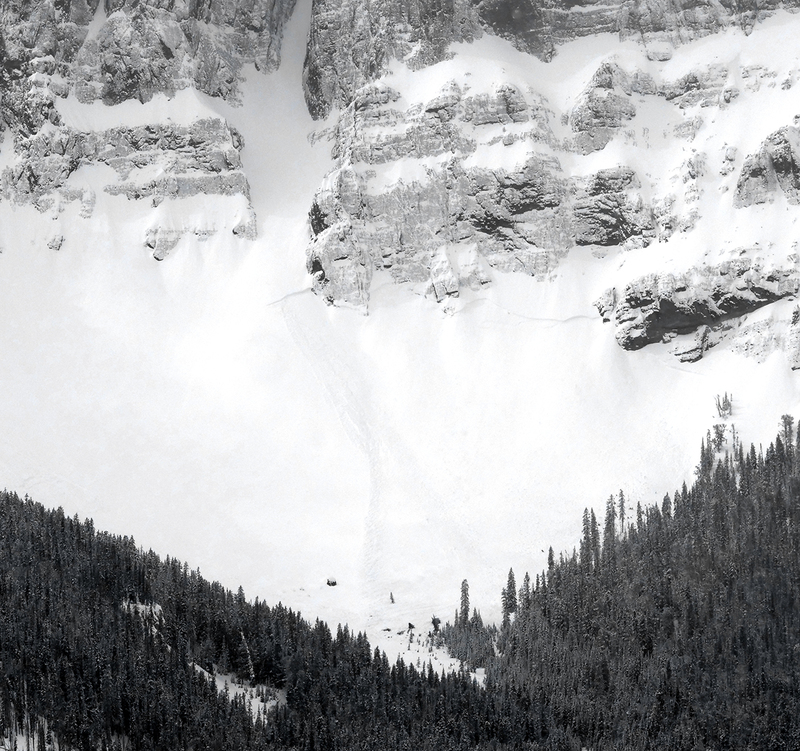 Be cautious of wind loaded slopes which are the most likely place to trigger a dry slab avalanche. Wet avalanche hazard will increase if the sun comes out and when temperatures exceed freezing (photo). Avoid steep slopes if the snow surface become moist or wet. Choose terrain that minimizes consequences of being caught in even a small slide. 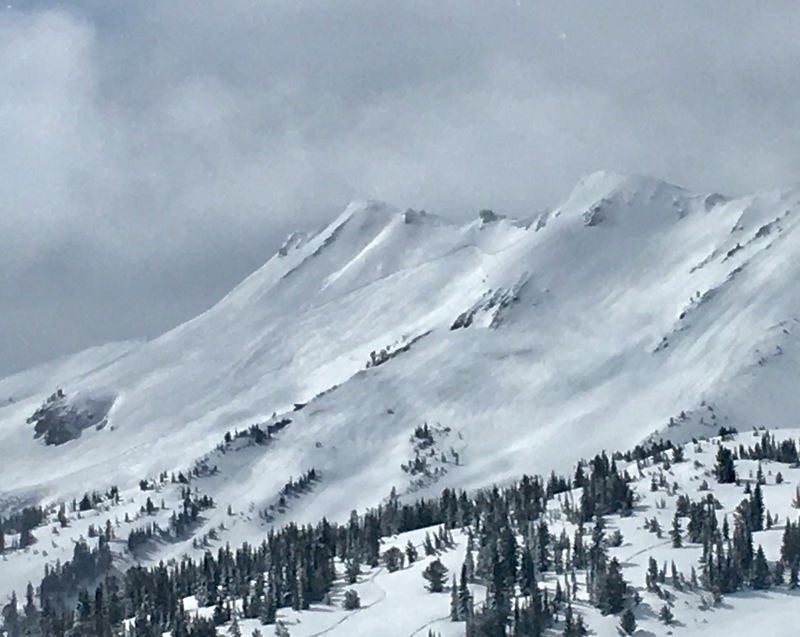 Yesterday Eric and I took down the weather station near Cooke City and saw recent widespread small avalanche crowns and a couple large slides (photo, details). It was full on winter up high with a couple feet of new snow (video), but town received no snow from the recent storm. This time of year conditions can change rapidly through the day or as you change aspect and elevation (video). Continuously assess your plan and anticipate changing stability. See below for general spring snowpack and travel advice. We are saddened to hear a skier was killed in an avalanche near Mt. Washington yesterday. Our condolences go to those involved, family and friends. Preliminary details here. 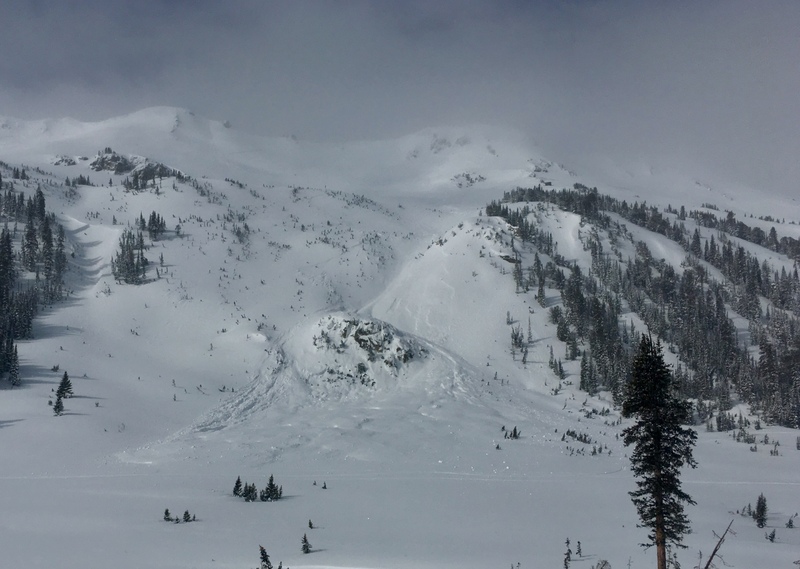 Spring weather can be highly variable and create a mix of avalanche problems to watch out for. Snow conditions and stability can change drastically from day to day or hour to hour. Anticipate rapid change and plan accordingly. Abundant snowfall over the winter with more spring snow to come makes avalanches possible into summer. Spring storms are notorious for depositing heavy amounts of snow in the mountains. Even with a deep and generally stable snowpack throughout the advisory area, heavy and rapid loads of new snow will decrease stability. The main problems to look out for are avalanches breaking within the new snow, wind slabs, and loose snow avalanches. The likelihood of triggering an avalanche spikes during and immediately after snowstorms. New snow instabilities tend to stabilize quickly, but it’s a good idea to give new snow a day to adjust before hitting big terrain. New snow instabilities can be difficult to assess, and spring storms bond to old snow differently across aspects and elevations. Conservative terrain selection is essential during and immediately following storms. Wind loaded slopes and slopes steeper than 35 degrees should be avoided for 24-48 hours after new snow and wind. New snow can quickly change from dry to wet on a spring day, and stability can decrease rapidly with above freezing temperatures or brief sunshine. New snow may bond well early in the morning, and then easily slide later. Wet loose slides are likely during the first above freezing temperatures or sunshine immediately after a storm. Anticipate changes in snow stability as you change aspect or elevation, and over the course of the day. An early start is always an advantage. Be ready to change plans or move to safer terrain at the first signs of decreasing stability. Or if you sink to your boot top in wet snow. In general, if the snow surface freezes solid overnight, the snowpack will be stable in the morning and stability will decrease through the day as snow warms up. The snow surface hardness, rate of warming, duration of sunshine, aspect and elevation determine how fast stability will decrease through the day. Be aware that sunny aspects may have a wet snow avalanche danger while shadier slopes still have a dry snow avalanche danger. Getting off of steep slopes should be considered when, or before, the above signs of instability are present. Wet snow avalanches, whether loose snow or slabs, can be powerful, destructive and very dangerous. Conservative terrain choices, starting early in the day, and careful observations can keep you safe. See Alex’s recent video, and this article for more spring travel advice. Cornices along ridgelines are massive and can break under the weight of a person (photo). Prolonged above freezing temperatures and rain make them weaker and possible to break naturally. They can break off suddenly and farther back than one might expect. 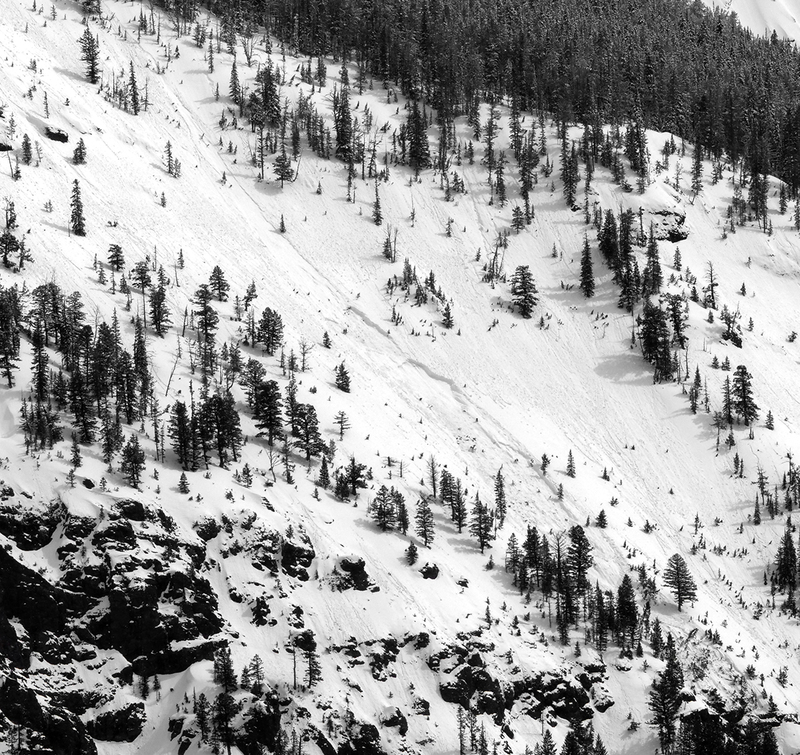 Cornice falls can also entrain large amounts of loose snow or trigger slab avalanches. Stay far back from the edge of ridgelines and minimize exposure to slopes directly below cornices. Regardless of whether a cornice triggers a slide or not, a falling cornice is dangerous to anyone in its path. It does not matter if new snow falls or not, avalanches will continue to occur until the existing snowpack is mostly gone. Always assess the slope you plan to ride with diligence and safety in mind. Do not let your guard down. Travel with a partner, carry rescue gear and only expose one person at a time in avalanche terrain. Have a safe and enjoyable spring and summer! Bridger Bowl is closed for the season. Backcountry conditions exist and there is no avalanche hazard reduction or ski patrol services. The Hyalite road is closed to motorized travel until May 16th. Bike and foot traffic is allowed. We will issue weather and snowpack updates on Monday and Friday mornings for most of April, and update our weather log daily. Natural wet slide activity on a west aspect around 8,600' near Cooke City.